After kvetching about how my new G2 doesn't come with a case, I bit the bullet and paid way too for an authentic T-mobile case. The one I bought isn't featured on the t-mobile site, but a similar one is: G2 Protective Cover. This model on eBay appears to be the exact model. The case itself consisted of two hard plastic pieces that wrap the phone, and a knob to snap into a belt clip. The hard plastic shell made the heavy G2 even heavier, and turned it into a clunky device. Because of the way the top shell wrapped around the phone, it crowded the top row of the keyboard. The result was that when I typed on the top row I had to pay extra special attention to pressing the keys in just the right location. The hard plastic shell totally threw off the balance of the slide mechanism. The result was that the keyboard now slid out way too easily. When my Brother saw how easily the keyboard slid out, he honestly thought I had a defective model of phone. The phone snaps into a belt clip and can be positioned at any angle. Problem is, unless you position the phone just right, gravity will cause the keyboard to expand. The result is that I had to clip the phone in place then rotate it until the keyboard didn't slide out. Bottom line - by adding this plastic shell, I took an elegantly designed phone and made it a clunky mess. I guess there was one more advantage to the case: taking it off made me feel like I got a brand new, sleeker, phone. thanks for the heads up. we ordered 2 G2s and now I'm in the accessory research mode. The problem is that there seems to be a big void in the market. I had the same problem with the G1 first came out. Hopefully there will be more cases available in the near future. Ooh, congrats on the G2 upgrades! I've ordered another case from eBay - I'll definitely let you know how it works out. So our G2s arrived yesterday... and while it looks a bit strange, it fits really nicely into the original G1 case. What's your appbrain link, so I can peek as to what you're installing on the device? Mine's here. the only downside to the G1 case... doesn't have a clip to hook it to your belt. The fun part when searching for cases is that the original 'MyTouch' acquired the nickname G2 way back when it first came out so searches tend to pull up cases for that too. Ahhh - that's good to know that the myTouch being nicknamed the G2. 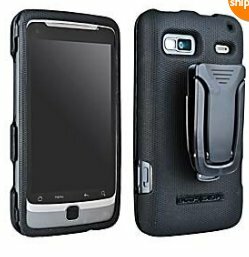 I saw cases for the "HTC G2 myTouch" and was left wondering if that would fit. Hmmm, wonder if the case I bought fits the phone. Oh well. Remind me why this phone can't come with a cheap, but functional, case?